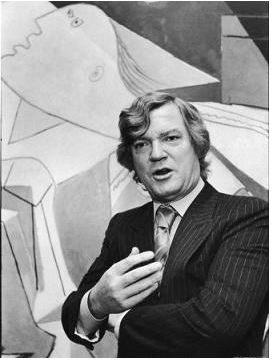 I would imagine most of you are familiar with Robert Hughes. The Australian art critic wrote for TIME magazine for over 30 years, has made dozens of TV documentaries, published many books and won countless awards, too numerous to list here. Pictured here in his debonair younger years, Hughes, now 72, always outspoken and sometimes controversial, is indisputably one of the most famous art critics in the world. He is probably best known for his views on the modern art world, specifically the marketing of artists that started in the 1960’s and had its heyday in the extravagance of the 80’s. He felt many artists, including Jean-Michel Basquiat for example, were overrated and over-hyped. He described Basquiat’s Whitney retrospective as “a parody of a funeral rite” and wrote equally unflattering comments about the work of David Salle. “Looking at his work is like watching a TV set in the rain with the sound off”. Looking back now, even Hughes admits that he may have been too hard on some of these artists. No matter how you feel about Hughes’ views, it cannot be argued that his articulate and entertaining presence is a force to be reckoned with. I recently became aware, via The Observer’s Very Short List, of a documentary film he made that was broadcast on British television’s Channel 4 in 2008. Called the Mona Lisa Curse, it is a fascinating work. I’ve attached the first episode (of 12) here. As VSL says, if you “Ever feel like you don’t “get” the art hanging in museums and selling for millions in auction houses”, this film is for you. Judge for yourself. I’ll be curious what you think. This entry posted in art, art history, entertainment. Entry Tags: Jean-Michel Basquiat, Robert Hughes, The Mona Lisa Curse Bookmark the permalink. Hi: I found you through your comment on CTD. I watched the ENTIRE series on Robert Hughes. It was beyond fabulously educational. I have tried to read so many books, to understand the artists that everybody loves, that I HATE! Thank you for a non pandering, passionate critic. Where have I been? All I do is read, and there is still so much I need to learn. That was one of my top 10 favorite posts. Send me some of yours and I’ll do an editorial round-up. Inspirational!! I’m subscribing, come visit me! Hi Liz – So glad you found me AND enjoyed the post. Isn’t it enlightening? You’re ahead of me as I haven’t yet had the chance to watch all the episodes. There’s never enough time to read everything out there. But that’s what keeps us vital – that craving to keep learning. I’ll be right over to visit! It seems to me that Robert Hughes has a remarkable ring of truth to his views from every angle. Although I make my own living as an artist, I have never known a great deal about the particular major modern American artists, the collectors, and the museum directors that this film examines, and the film was a considerable revelation. It was almost painful watching his interview with the Warhol collector, who must have felt very humiliated, and although he seemed very shallow, I think Hughes did not have to bury him to prove his point. The cast of characters from Skull to the pair of art consultants at the Armory Show were largely grotesque, no matter how clever they may be at profiting from art. The remark Hughes made about his own criteria for valuing a work of art was beyond reproach, although I think there are many other reasons why people love art, some not nearly so profound, but still valid in their own right. His comparison between the Mona Lisa and the Klimt portrait seemed so completely true to me, and yet I still prefer the Klimt painting, just as I prefer many other lesser paintings to the Mona Lisa. Paintings to me are like friends, and you don’t choose your favorites simply because they are the smartest people, or have the most money or social influence. I wonder if the degree to which Robert Hughes enjoys a work of art is always relative to its greatness. His film was amazing, and he comes across to me as a major example of integrity in the contemporary art world. I hope you had a chance to watch the other episodes! So pleased to receive your very discerning and cogent reaction to the Hughes clip. One of the many reasons Hughes is so popular is that he dares to speak what so many are merely thinking. His global view of art and its value culturally obviously resonates with many like yourself, although I understand your skepticism regarding his seeming favoritism towards “great” works. Perhaps he is an art snob of sorts but perhaps he is really a populist in terms of his broad interests in art and history as well as his mission to elucidate the public. He is certainly a brilliant critic but also a showman, which is what made this and his other series so watchable. I think my favorite Hughes quote (of which there are many) is ““The greater the artist, the greater the doubt. Perfect confidence is granted to the less talented as a consolation prize.” I have yet to complete the entire series but certainly will once everyone is back in school. And I’m now of course curious about your own art – is there someplace where we can view your work? It was a pleasure to see your thoughtful response. I’ve never seen any other Hughes films, and would not even know they existed were it not for your blog, but I’ve read many of his columns in Time Magazine, and always felt that Hughes had a very penetrating perception of art. I wouldn’t go so far as to call him a snob, but I think he can’t help but seem hard on others because his perceptions run a lot deeper than those of most people, and he is just being true to himself and clearly loves what he does. However, if all the world were as demanding and as discerning in deriving pleasure from art, we would probably narrow down the field of the world’s art to a group of work that might fit in a few large museums, and the rest of the world would be devoid of anything most of us enjoy and consider to be art. Very few people can be great artists just like the small number of the world’s best tennis champions or Nobel Prize winners, but the world would seem a pretty barren place if the enjoyment of art were confined only to the work by the greatest individuals. The glimpse into the New York art scene that the Hughes film offers left me somewhat disgusted with the way in which things seem to work when it comes to the buying, selling, and collecting of the most sought after work, and as Hughes pointed out, not necessarily the best. Thomas Hoving has left me with a feeling of dislike for many years, but I’d never seen him on film before, and I think his career says a lot about how the more exclusive levels of the art world have operated over the last 35 years, given that he was once the director of the MET. I think some things that he did were very constructive, but as a person I was left with a feeling of complete dislike, and I find his successor to be a great relief. I was very curious to see what you might say about Hughes and his film, and thank you for the insightful remarks you made. Harrison – it’s been so gratifying to see the positive responses to this post, including yours of course. You could now move on and watch the other Hughes videos, especially the Shock of the New and American Visions, both of which are I believe on you tube. I met Tom Hoving years ago when I worked in publishing. He was indeed rather full of himself but really did quite a lot for the Met. The Tut exhibit, however, represented the same problem Hughes objected to with the Mona Lisa exhibit. Those days are long past and blockbuster exhibits at museums are not only common but welcomed, especially in these times where less and less money is being allocated to the arts. And that leaves us yet again with the dilemma of art vs. money. I just want to thank you for your final reply to my comments. I’m going to make a point of finding the other Hughes films on YouTube. Given the remarks I made about Thomas Hoving I’m glad he didn’t turn out to be a good friend of yours!! Hi Stacey! I just came across this interesting post on your blog and have not seen the Mona Lisa Curse. I forwarded on Part 1 to my niece who is studying in Florence this semester – since this is where Hughes love of art began. I look forward to watching all 12 episodes. I enjoyed the exchange between you and Howard H. He’s a wonderful, thoughtful guy! Have a great weekend! 87 queries in 0.434 seconds.